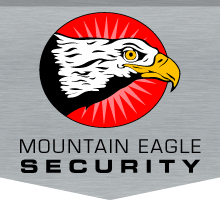 Who is Mountain Eagle Security? Cranbrook's Mountain Eagle Security has been in business in the Kootenays since 1988. We are a locally owned and operated business that has seen tremendous growth over the years. Our direct, hands-on approach to doing business is one of the factors that have made this company a success and what continues to move this company forward into the future. Our staff is the other factor—we have an amazing team of professional and dedicated individuals who are willing to do whatever it takes to do the best job. At Mountain Eagle Security, we adhere to an “open-door” policy and direct communication is encouraged. We realize that our employees are a key element to our success and therefore we work from a place of mutual respect and co-operation. That philosophy and attitude in turn spill over into the work environment, where people are happy and content, and therefore do an outstanding job. We are proud of our company and employees, and we look forward to many more years of providing the highest levels of professional security in the industry. The mission of Mountain Eagle Security is to protect people and property using a client-centered approach utilizing fully trained and licensed security guards. Mountain Eagle Security implements policies and procedures through the use of non-violent interaction whenever possible, incorporating professionalism, integrity, honesty, and confidentiality into the work environment.